I roll the last of the ceiling and have about 5 seconds to admire my work when I get the following text “have you ever used Ben Wa balls?” The award for most unique question I’ve been asked in ages goes to…a good friend with an intimate personal dilemma. 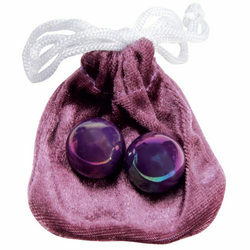 She explains that she bought a set of purple Ben Wa balls, she includes the color ’cause I love purple (let me point out that I am in no way personally invested in the color of her Ben Wa balls). But, I digress, back to the matter at hand, or perhaps more accurately located in a more personal anatomical location. Apparently, she’s lost one. Explains that the first time she used them, they kept falling out…too much information…I don’t have a clue how big these things are and I’m thinking kegels girl, kegels (in her shaky defense, these ones are apparently relatively small). She bought them for a night out and I’m now envisioning her at a bar, dropping purple Ben Wa balls on the dance floor. I’m not sure how expensive they are but I can’t imagine any incentive for retrieving them in public. The dark and twisty side is cobbling together an adult version of Cinderella that Disney wouldn’t touch. Handsome stranger navigating the bar clutching a purple Ben Wa ball trying to identify the owner. Excuse me miss, perchance have you lost something? This line delivered while cradling a wayward Ben Wa ball that has rolled across the dance floor in a bar in the palm of his outstretched hand. Of course, if I follow the comparison to the Prince slipping the glass slipper back on Cinderella’s foot, this is a story the two would not be telling future generations when they ask how Grandma and Grandpa met. On her second attempt, she’s experiencing a completely different problem…she can’t retrieve one of them. It’s hiding “somewhere”. There’s not a whole lot of “somewhere” it could be, I think we can safely skip the call to Quantico, this is not going to require an FBI grid search. Wants to know what she’s supposed to do and how long it’s safe to leave it in. Not a clue, my friend, not a clue. So, I did the only thing I could think of to be helpful…I googled it. I pass on this information to her as well as a confession she’s already aware of…I’m laughing so hard, I’m crying. I still have paint in my hair and in my ear and I’m sitting at my laptop googling Ben Wa ball extraction techniques. The retrieval cord idea is brilliant (I’m seeing children’s mittens on strings) but is more of a preventative idea than a solution to this particular problem. I suggest jumping jacks and some Astroglide. More laughter, more tears. I’m not sure how many problems are solved with a combination of jumping jacks and Astroglide, but it’s all I got for this one. Barring that, I’m hoping that maybe if she just heads to bed for the night, it will just wander out on its own. Of course, if that doesn’t happen, she’s going to be quite a hit in her local emergency ward explaining her situation to the triage nurse. (Side note – while googling the Ben Wa issue, I came across a reference to something called Analball Bingo…seriously, google it – I’m not making this up. I have no idea what it is and the picture of the required apparatus didn’t clear up that particular mystery even a little bit…I don’t know wtf kind of dabber one would use for Analball Bingo but I think it’s better that I never know. As much as I pride myself on being fairly knowledgeable and open minded, I’m just going to let this one go). Update: newsflash, this just in the next morning…the solution to the problem was time and gravity.